The Arc of Gaston County is committed to securing various opportunities for all people with Developmental Disabilities in order for them to choose and realize their goals of where and how they learn, live, work, and play throughout Gaston County. Your donations provide much needed support for our efforts. We hope you will consider a monthly deduction. For the cost of eating out for lunch or dinner for two at a restaurant each month, you can truly make a difference in the lives of children and adults with developmental disabilities in our community! 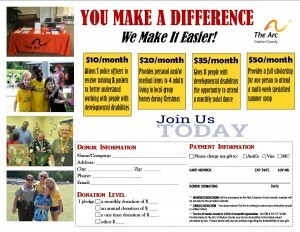 Click Here To Help Support The Arc!